After wading in a puddle of radioactive waste, these radical reptiles are transformed into New York City's greatest crime-fighting quartet! The Baby Turtles are still tiny but ready to train with their master Splinter. These detailed, poseable figures stand 4-inches tall, making them perfectly in scale with NECA's 1:4 scale TMNT action figure line, and they come with plenty of accessories (sold separately). 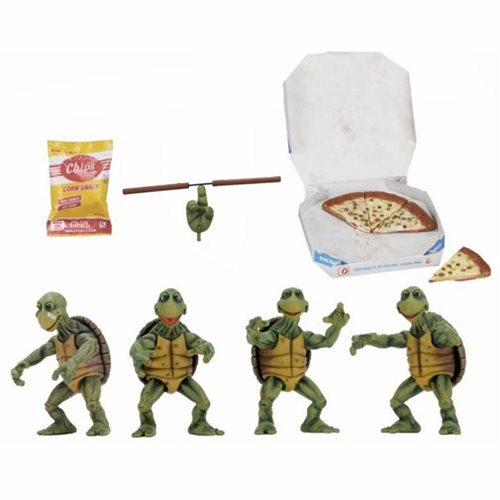 The set includes 4x Baby Turtles, pizza box, 4 slices of pizza, and bag of corn chips, plus a cool bonus-nunchuks and alternate nunchuk-spinning hand for the 1:4 Scale Michelangelo Action Figure (sold separately). The Teenage Mutant Ninja Turtles Movie Baby Turtles 1:4 Scale Action Figure 4-Pack comes in window box packaging, Ages 14 and up.